Please watch Parts 87 and 88, before proceeding. In this video we will discuss about folder level authorization, with an example. Consider the project structure, shown in the solution explorer below. Only administrators should be able to access the pages in "Admin" folder. The rest of the pages can be accessed by anyone. To achieve this, add another web.config file to the "Admin" folder and include the following authorization element. Application root level web.config file. This allows access to all authenticated users. Is it possible to have more than one web.config file? If yes, when and why would you use more than one web.config file. This is one of the classic examples, where we need more than one web.config files. 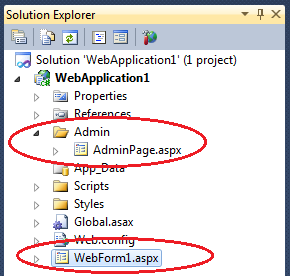 If you want to execute the application code, using the logged in Administrator account, then enable impersonation, in the web.config file of the Admin folder. With this setting in place, all the pages in the Admin folder are executed using the logged in user account, where as the pages outside of the folder are executed using the identity of the application pool. It is also possible to impersonate, with a specific user name and password. With this setting, whenever any user belonging to the "Administrators" group requests a page from the Admin folder, the code will be executed using "Venkat" account.